2nd in the battle line behind König. 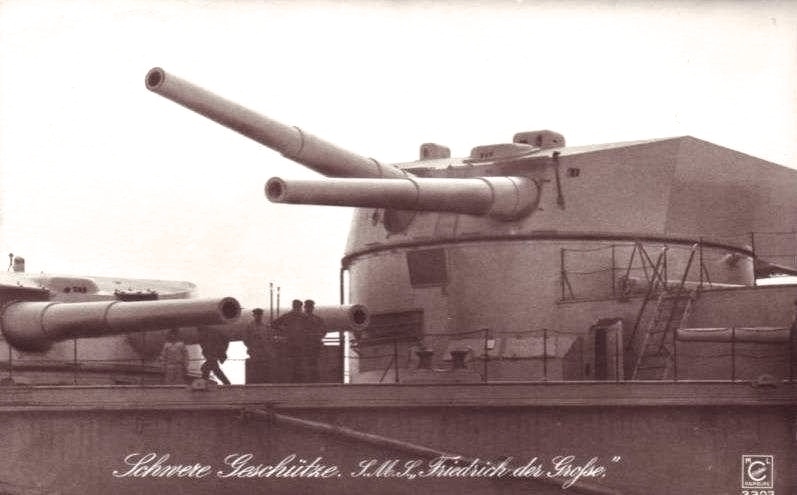 GK engaged Princess Royal at 21,000 yards after Scheer closed in at 17:45 to get the British battle-cruiser range. 18:00 shifted fire to Valiant "after the faster British ships began to pull away from their pursuers" (Wiki). Straddled her 4 times but incorrectly claimed a hit.18:09 GK hit by a 15" shell from Malaya or Warspite, The hell hit the water and impact around 85&apos; from the bow. GK&apos;s secondary battery engaged a British destroyer(probably Moorson) and claimed three hits. Fired at 18:22 at Moresby but without any hits. After 19:00 fired at very close range at Defence which blew up and sank at 19:19. Then GK under fire from British battle line and hit 7 times 20:18 to 20:19, three of which were 13.5" shells from Marlborough. Barham or Valiant&apos;s 15" were the remainder. Destroyed the port side No.2 wing gun while the other hit the main belt causing 4 degree list after she took on around 800 tons of water (By the time she reached home waters, she&apos;d taken on around 3,000 tons).In the night formation was the 15th ship. Attacked at around 02:45 by 6 british destroyers. GK managed to hit one with 15 cm fire (the Nessus) and disabled her boilers. 3 AEG Vulkan steam turbines driving three shafts rating. Steam was raised from three oil fired and 12 coal fired Schulz-Thorneycroft boilers.